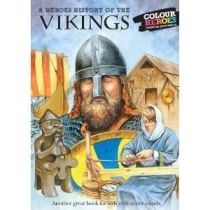 The Vikings came from their Scandinavian homeland, terrifying the Anglo-Saxons who had settled down in England. Their savage raids in dragon-headed longships have become a well-known part of our history. However, the Vikings also settled down, farmed the land, traded goods with other countries and were skilled explorers, artists and craftsmen. They sailed as far west as North America centuries before Christopher Columbus and reached Jerusalem and Baghdad in the east. The Viking Age lasted about three hundred years. The Vikings brought dramatic changes to Britain and their influence can still be seen today. You can read more about these fascinating people and learn about this exciting time in our history in the following pages of this book.